According to the World Convention on Biodiversity Report (2010), over half of the world’s species are vulnerable, threatened, or extinct. ESI seeks to further the understanding of this crisis, its causes, and possible solutions through extensive efforts across the Texas and global landscapes. 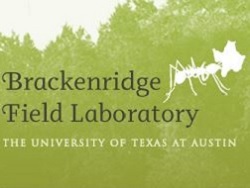 Check out the research, teaching, and facilities of The University of Texas at Austin Brackenridge Field Laboratory. UT-Austin is an urban campus, but just three miles away is a premier urban field research station, the Brackenridge Field Laboratory (BFL). Researchers and students have been collecting data at this 82-acre riverfront facility on climate change, invasive species, biodiversity, genomics, animal behavior and evolution for over 40 years, and ESI and BFL have a longstanding relationship. In 2013, ESI-affiliated faculty Larry Gilbert and Christine Hawkes, UT researchers Rob Plowes and Ed LeBrun, and Argentine and Kenyan colleagues received a $2.7 million, six-year grant from the Lee and Ramona Bass Foundation to establish the Texas Invasive Species Program, to study invasive pests in their native lands and to identify controls applicable for Texas. Environmental Science undergraduate students make use of the field lab in the EVS311 course and as part of their Capstone Research Projects. For a more whimsical take on BFL’s important biological research, check out the July/August 2013 “Forty Acres Field Guide” feature in the Texas Exes’ Alcalde magazine. Invasive species have received considerable attention from resource managers and researchers as a biodiversity threat. They are often introduced to new geographical areas and habitats by human transportation systems, and are enabled by the lack of natural predators as well as disturbance or destruction of habitats supporting native fauna. Dr. Lawrence Gilbert, an ESI faculty affiliate, studies invasive fire ants to find ways to manage their impact on local systems. Native to Argentina, this imported red fire ant is considered a pest to agriculture, and a threat to native plant species in Texas. To combat the ants, Dr. Gilbert’s Texas Fire Ant Lab is studying the ecology of three fly species (also from Argentina) that are natural fire ant parasites. Through this parasitism the flies can infect ants with a pathogen that causes a disease, thereby reducing their population size. 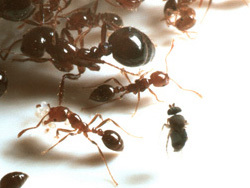 As Director of the Texas Fire Ant Lab, professor of integrative biology and Director of UT’s Brackenridge Field Laboratory, Dr. Gilbert was named the 2012 Distinguished Texas Scientist by the Texas Academy of Science. 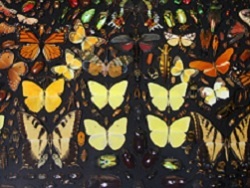 Butterflies of Texas in the Entomology collection at the Texas Natural Science Center. Studies of biodiversity require access to reference collections for identification and distribution information. UT holds some of the most informative and extensive collections of most Texas and regional organisms, managed by the Texas Natural Science Center, including: vertebrate and non-vertebrate paleontology, cave organisms and general entomology, fishes, amphibians and reptiles. UT also has major botanical and algal collections. These extensive collections contain invaluable records of present and past distributions that are essential to studies of environmental change and stress. More information on UT’s collections is available here. Camille Parmesan gave an outreach lecture addressing our global biodiversity crisis. Biodiversity is an essential part of the long-term functioning of our biosphere, and prerequisite to abundant resources. Protecting biodiversity is impossible without knowledge and support from the public. 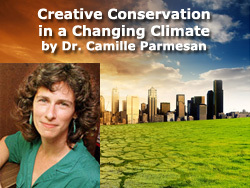 ESI’s Hot Science – Cool Talks public outreach series featured Dr. Camille Parmesan, who gave a lecture entitled “Creative Conservation in a Changing Climate” to a lecture hall and Webcast audience packed with school teachers, students, and community members. She outlined several important threats and potential solutions to declining global biodiversity and climate change, which are connected issues. View a complete list of past outreach lectures including on-demand webcast footage and presentation files in the Hot Science – Cool Talks Lecture Archive. Left top: Healthy Senecio vulgaris growing in California where it was introduced approximately 100 yrs ago. 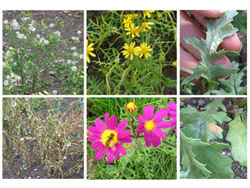 Left bottom: Dying Senecio vulgaris covered in Puccinia and Albugo pathogens, growing in part of its native range in the UK. Center top: Senecio squalidus growing in the UK where it invaded nearly 400 years ago, with some Puccinia infection. Center bottom: Senecio ciliocarpa growing in the UK where it was introduced less than 10 years ago with no infection. Right top: Albugo. Right bottom: Puccinia. Photos by Christine V. Hawkes; caption courtesy of Texas Science News. ESI’s faculty affiliates provide promising undergraduates the opportunity to gain valuable biodiversity research experience. Dr. Christine Hawkes is an active participant in research work with ESI. Recently her lab performed a meta-analysis of invasive plant species case histories, and discovered that their immunity to predation by local species is not permanent. Over time, introduced plant species eventually change in ways that make them more vulnerable to pathogens or predation in their new environments. Further research about the ecological trajectory of invasive species will enhance management strategies for them.